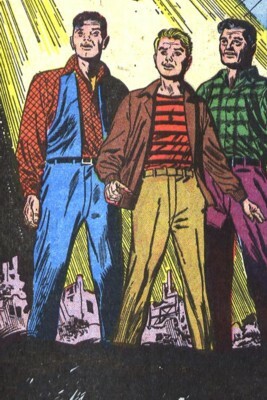 Membership: "Darren Darcey," "Robby Kanczuzewski," "William Minnick," "Carl Rosner"
Power/Abilities: "The Strange Ones" were mutants ("...the next advanced link in the chain of man's evolution"). They were said to be able to sense events before they happened, and their mentality was far ahead of the best brains of the day -- they knew by instinct what takes a normal genius a lifetime of theory and experimentation to learn. Their superior physiology allowed them to avoid sickness, but the mutants were misfits and could never find a place in society. History: (Strange Tales I#31/5) - In New Mexico, scientist "William Minnick" was struck and killed by a car as he crossed the street. Later that day, his fellow scientists at the atomic station were discussing their deceased colleague, wondering why he hadn't sensed the approaching danger, since "his kind" always seemed to sense events like that before they happened and avoided them. When Dr. Falten, who was new at the center, inquired what his co-workers meant by that, the others told him that "Minnick" was "a man of the future" -- a mutant. Suddenly, another scientist came running into the meeting and called the others to the atomic pile, where the nuclear reaction was running out of control; this was why "Minnick" was unable to avoid the car -- he was too wrapped up in thought over the greater danger, the research center's nuclear reactor. Fearing that the nuclear reaction would burst forth, spreading its deadly radiation over the earth ("...turning mankind into corpses or monsters and imbeciles! "), the scientists raced to find another mutant to take the deceased "Minnick's" place ("Only one of those superbeings can help us now!"). The scientists located a mutant -- "Darren Darcey," a man living in the hills of Kentucky -- but he was killed by his fearful neighbors before they could reach him. 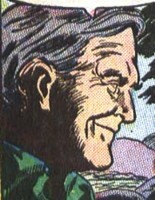 They later located another mutant -- "Carl Rosner," a hermit living in the woods beyond a city. They sent a helicopter to pick him up, but it was a stormy night, and lightning hit the helicopter as it carried him off, causing it to crash. "Rosner" died shortly after the crash, but before his death, he told them of a boy, "Robby Kanczuzewski," who was also a mutant. The scientists frantically searched until they found the boy, but he was in a hospital, where he had just undergone an operation which had converted him to a "normal" boy of sixteen -- he was no longer a mutant. Comments: Created by an unknown writer and Art Peddy. This group was only called "The Strange Ones" in the story title, and none of the characters (except Falten) were identified -- they were only identified as "boy," "hermit," and "witch man" --so I took the liberty of giving them names -- I just grabbed a local telephone book and tried to find names that hadn't been used for any characters in the Marvel Universe yet. Although it was stated that "Minnick" was in New Mexico and "Darcey" was in Kentucky, it was never specified in what area "Rosner" and "Kanczuzewski" lived; all that was stated was that they were "a thousand miles away" from the atomic research center. This was a quickly paced tale that crammed a lot of sub-plots into what was only a five-page story -- it definitely could have used several more pages. But this story foreshadowed the anti-mutant bigotry that would later be seen in the X-Men series nearly a decade later. No explanation was ever given as to how Falten's team located the mutants -- perhaps they were using technology that was similar to Charles Xavier's mutant-detecting Cerebro. 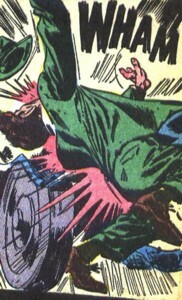 Considering that the mutants in this story only had superior mental abilities, perhaps that nuclear reactor disaster was responsible for an increase in the background radiation on Earth, resulting in future mutations that were of a more physical nature, and an overall increase in the mutant population of Earth. And a BIG Thank You to the Atlas Tales site for allowing me to use the scans of this story! He worked at an experimental atomic station in New Mexico. One morning, while crossing the street and deep in thought, he was struck and killed by a group of kids speeding in their jalopy. He was thought by his fellow scientists to be a mutant, and when Falten looked up his records, he found that "Minnick" was not even a college graduate, thus confirming their suspicions. 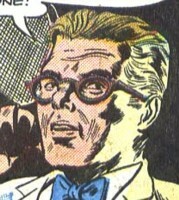 Following the death of "William Minnick," he was one of the other scientists at the atomic research center who worked to organize the group's efforts into finding another mutant whose super-intellect could help them stop the atomic pile from going out of control, and hopefully avert a nuclear disaster. A sixteen year-old boy, he was a mutant with a super-intellect that made him a misfit in society. His teacher advised his parents to take him to a good doctor. When the boy finally left, he told the hermit that he had an appointment with a doctor. The boy was later subjected to an operation and glandular treatments which reduced his intelligence and made him a "normal" boy. An older mutant, he lived in a small cabin in the hills beyond a city. He had no education, yet he read the deepest books and chuckled over their mistakes. He invented things no one but he could understand, and he painted masterpieces. "Rosner" met a boy who had been wandering through the woods, and as the two conversed, the older man sensed that the boy was also a mutant. One dark and stormy night, a team of scientists sent a helicopter to pick "Rosner" up so he could help with an emergency. He felt somewhat reluctant to take the trip in the severe storm -- although he said he had a little gadget that could control the weather -- but got on board the aircraft anyway. As the helicopter took off, it was struck by a bolt of lightning and crashed. Before "Rosner" died from his injuries, he told the scientists about the mutant boy nearby who could help them. He lived by himself in the hills of Kentucky, and he was feared by the simple-minded mountain folk who thought him "queer" and called him "Witch man" ("McClay's sow done lost her litter right after you'd been a-lookin' at her!"). But before the scientists could send a plane to pick "Darcey" up, he was shot by his suspicious neighbors, who were afraid he would put a hex on their crops.